“Retelling the history of net art from the 1980s through the present day.” – a few, simple words suffice to introduce the “NET ART ANTHOLOGY” online exhibit curated by Rhizome.org. Digital art lovers will be more than pleased to find some of the most famous internet artworks (we could even define them “cult” works) that have been around since the 1980s when the Internet made its impetuous entrance into our lives. Over time these works have been analysed and standardized; their evolution has taken place by way of new propulsive, technological and theoretical incentives. The exhibit’s venue is obviously the Ether. Scheduled to last two years, the exhibition will display 100 works of net art on a weekly basis – complete with critiques.The main goals of the exhibit (and of Rhizome in particular) are to preserve works and make those not always accessible to the public easier to view. Above all, attention is drawn to an effort to provide a perspective to a type of art that has been historicized but lacks a catalogue: in other words, the history of this art form is written by gathering the elements of a hypothetical aesthetic canon. 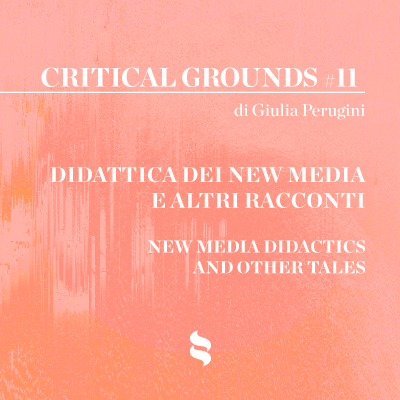 The first chapter of the exposition, “Part 1: 1984-1998”, opens with the renowned Cyberfeminist Manifesto for the 21st Century from the VNS Matrix, founded by Josephine Starrs, Julianne Pierce, Francesca da Rimini and Virginia Barratt, all-female artist collective. The year was 1991 and the promises of a new digital society presented the occasion to ironically affirm that it was no more than the evolution of a patriarchal society. 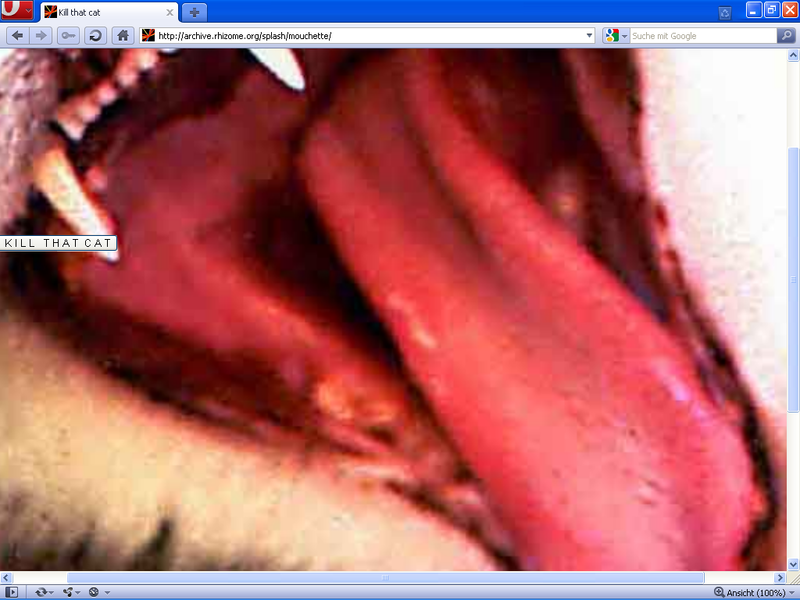 From theory to practice, verbal language was the new arena to be explored by net artists. In 1985 Eduardo Kac launched his Reabracadabra, a visual poem created and shown on the pre-internet telecommunications network Videotexto. 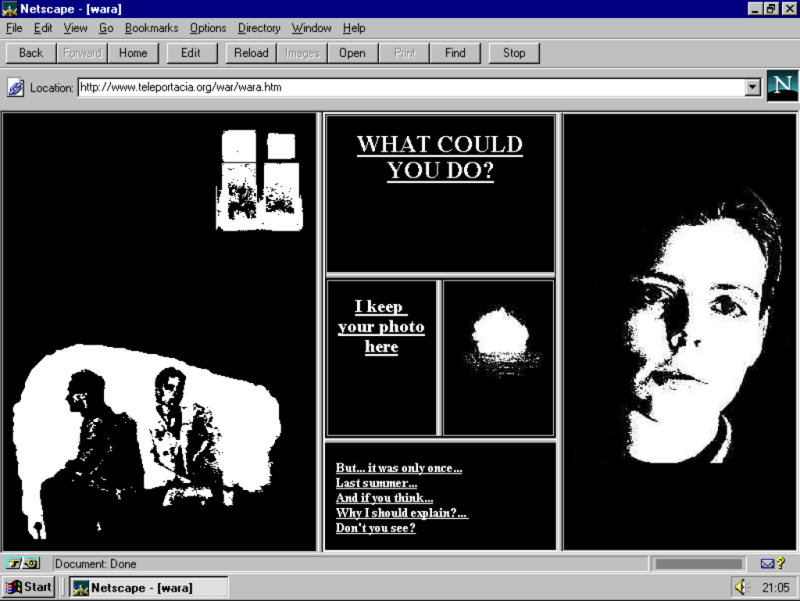 Olia Lialina was developing her interactive hypertext storytelling using nested frames and images for her 1996 work entitled My Boyfriend Came Back from the War. But work featuring technical means is only a portion of the poetics of the internet artworks of the 1990s. Internet was not only a medium. It represented, as it does today, the collective spirit. Antoni Muntadas gathered documents that were object of censorship on a global level and made it possible for anyone to expand upon the project via the internet for his 1994 installation entitled The File Room. The work is a process which is reactivated for the occasion of the Rhizome exhibition. Artwork, language, process, collective spirit and – above all – activism are all at the base of infowar. FloodNet (1997), a conceptual work and an instrument for the on-line collective action of the Electronic Disturbance Theater group of performance artists: Internet as an agora becomes the gathering place for political protests and virtual sit-ins. The question of identity (real, fake, hidden, public, stolen, duplicated) has been a core issue since the earliest days of the Internet and in Martine Nedda’s MOUCHETTE, active since 1996. MOUCHETTE is 13 year-old whose story and life are on display on her website and are created progressively by way of her interaction with the public. The result is her remarkable presence on the web and a social network archive filled with discussions, provocations, fan art and identity thefts. Artwork, process, collective spirit, infowar, language/communication: words with new and unexpected meanings come to life in 1994 from Mez Breeze’s playful experimentation on writing. Her Mezangelle poetry is an online codework – a new code whose base construction is a combination of human language and machine programming. We have no way of knowing what Net Art Anthology has in store for us until 2018. 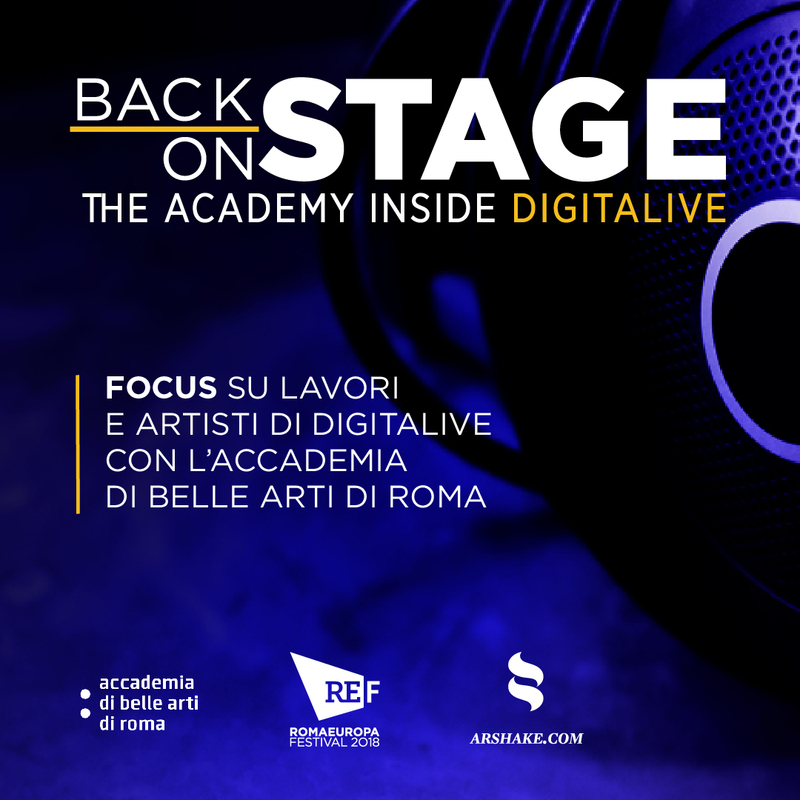 This is an ambitious work-in-process which is committed to the preservation of artworks, resetting mechanisms in motion and contributing to digital historical memory. The exhibit has just begun to draw its outlines but it promises to ultimately display the broadest and most sensational portrait of a chapter of an art form which – in step with the web’s technological evolution – is destined to amaze us in the future. A monumental leap covering over 30 years makes it possible for us to better appreciate the sincere enthusiasm and dynamic curiosity for speculation of the pioneers of Net art, completely deleting the predictability factor of today’s Internet for the digital generation and recovering the pre-historical aspects of many devices. It’s almost as if we are being reminded of “the way we were”. (cover 1) Electronic Disturbance Theater, Flood Net DDK (1999). 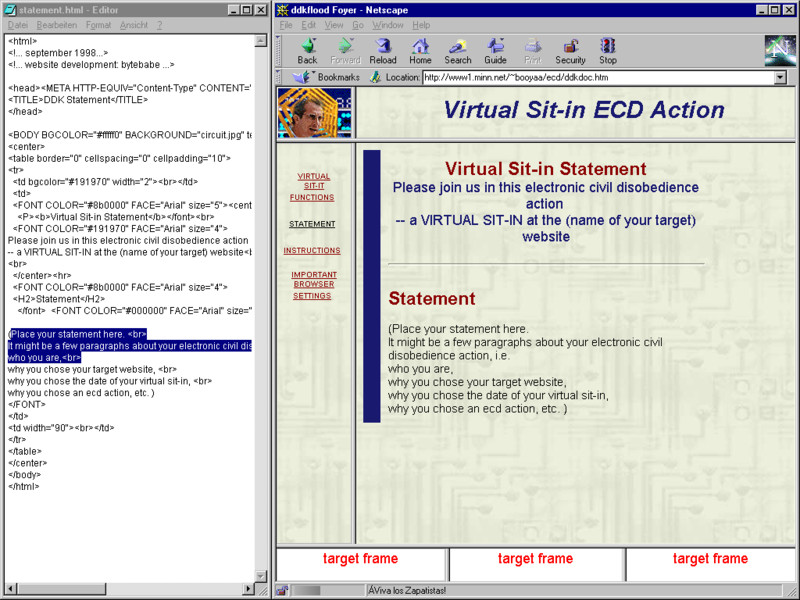 Web page with Java Applet used for virtual sit-ins. Courtesy of the artists. (2) Olia Lialina, My Boyfriend Came Back from the War (1996). Website. Courtesy of the artist. (3) Mouchette, Kill That Cat (1999) from the project Mouchette.org (1996-ongoing). Website. Courtesy of the artist.